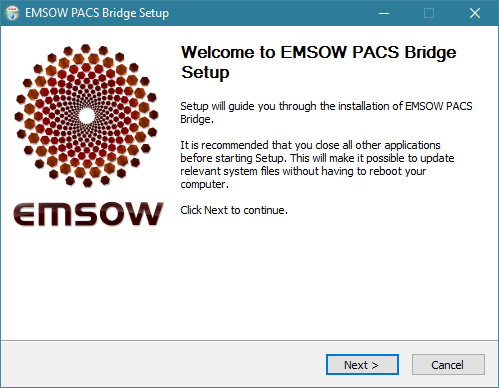 Visit emsow.com/downloads to download the latest version of EMSOW PACS Bridge. On the second page, you can change the destination folder, if needed. Step 2: On the third page, change the Domain field to your EMSOW domain name and click Next. Step 3: On the Installation options page, we recommend that you select the options to create links (shortcuts) in the start menu and on the desktop, as well as to add the necessary ports to Windows Firewall. We also recommend selecting the Install Java option to install a standalone Java distribution in the application’s folder. You do not normally need to select the Install DNS/DHCP Server option. However, it can be useful if you connect your diagnostic equipment to your computer’s Ethernet port (or a USB Ethernet adapter) and your equipment must be assigned a dynamic IP address. Make sure to select the correct Ethernet LAN interface and not the interface that is used for internet connectivity (such as a Wi-Fi interface), otherwise you may lose your internet connection and will need to reinstall Bridge using the correct network interface. 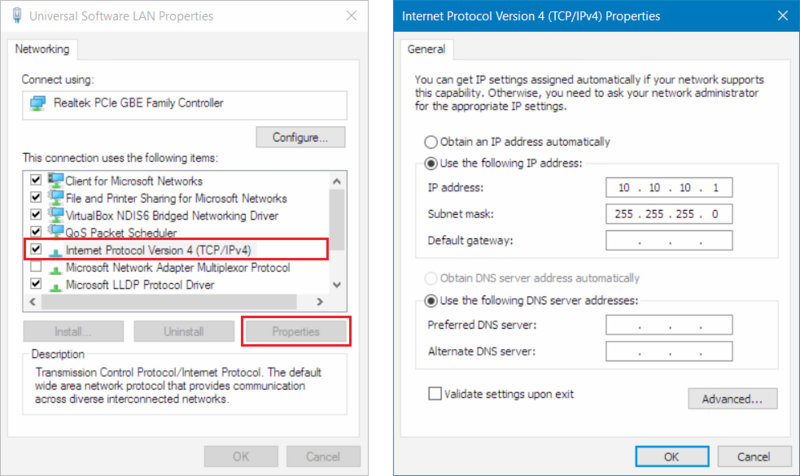 Please be careful using the DNS/DHCP Server option and contact EMSOW support if you have any questions about this feature. The Mode option allows you to select the user interface type. Most customers are recommended to use the graphical user interface (GUI) option. Use the GUI and Console option if you wish to see connection-related technical information in real time when you are using Bridge. This information is also stored in log files in the logs directory inside of the installation location regardless of the user interface option and is useful for troubleshooting. After selecting the options, click Install and wait until the installation is complete. Then click Finish to close the installer. Note: The 10.10.10.0 network is used as the recommended example for a direct Ethernet connection between your computer and diagnostic equipment. Other local IP ranges are supported as well; however, you should make sure to avoid address conflicts. 1. Press Win+R on your keyboard, enter ncpa.cpl and press Enter. The “Network Connections” control panel will open. 2. Right-click your Ethernet adapter, select Properties. Then click OK. You may need to restart your diagnostic equipment. The EMSOW PACS Bridge window will open. To upload images via Ethernet, initiate a DICOM transfer on your equipment. To upload images from a USB flash drive or another file storage, use the EMSOW PACS Bridge Upload icon on your desktop. Double-click the icon to open Bridge’s upload folder, copy the images to the folder, and run Bridge to start transferring them to EMSOW. In the Bridge window, you can see the list of studies arranged in the following columns: Confirmed, Date of Service, Patient Name, Date of Birth, Referring Facility, Referring Doctor, Study Description, Images, Status, and Progress. Auto confirm images – click this checkbox to immediately upload studies to EMSOW without your confirmation. This option is suitable for EMSOW sites that accept patient demographics information as entered by the technologist on the equipment. Confirm all – click this button to confirm uploading of all studies. Confirm selected – click this button to confirm uploading of selected studies. Here you can change the referring facility, referring doctor and study description. This allows you to keep the studies you upload in synchrony with the lists of doctors and study types on your EMSOW site. Click Save and Confirm to save the changes or Cancel to close the window without saving. Note: The option to edit studies is available only if the PACS server of your EMSOW site is configured to patch the referring facility, referring doctor and/or study description tags in incoming DICOM files. Please refer to the PACS Setup section to learn more. Resend all failed images – click this button to try uploading the images again if an error occurred during the uploading. After all the studies have been successfully uploaded, you can close the application. 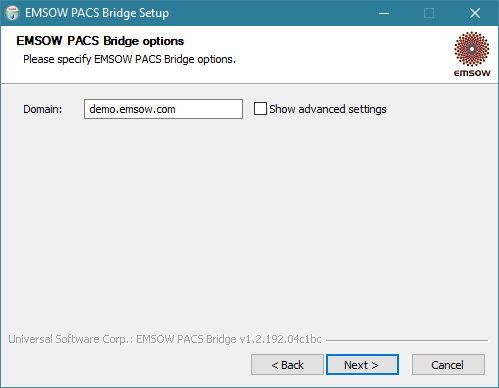 You can configure EMSOW PACS Bridge by editing the bridge.ini file. This file is located in the installation directory (by default, C:\emsow-pacs-bridge). You can edit this file in any text editor. The file structure is simple: each line contains a parameter and its value which are separated by an equality sign (=). USERNAME – your EMSOW username. 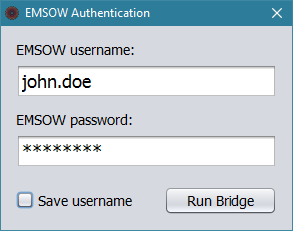 If the value is blank, then EMSOW PACS Bridge will ask you to enter the username on every launch. PASSWORD – your EMSOW password. If the value is blank, then EMSOW PACS Bridge will ask you to enter the password on every launch. DOMAIN – the domain name of the EMSOW site to upload images to. You are recommended not to include the slash at the end. SESSION – session name. The valid value is bridge or bridgeN, where N is an integer number. SERVER_AET – server AET (application entity title which is used to identify a DICOM application in the network). If empty, the default EMSOW PACS server is used (see PACS Setup). 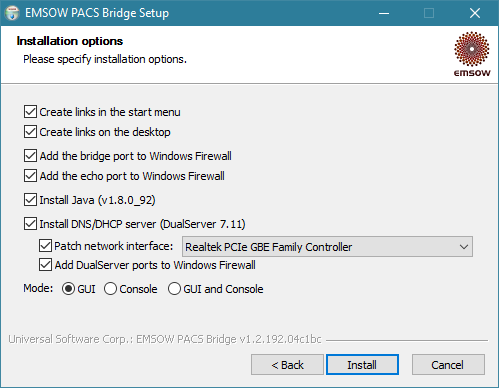 BRIDGE_AET – AET which is assigned to EMSOW PACS Bridge; UNVSCP by default. BRIDGE_PORT – the port on which EMSOW PACS Bridge listens for incoming connections from your diagnostic equipment; 39999 by default. 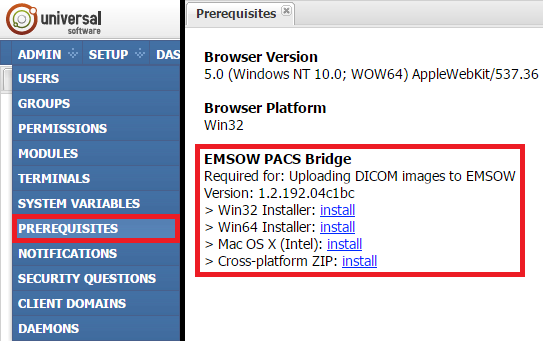 CAPABILITIES – DICOM capabilities of EMSOW PACS Bridge. The available values are STORE and ALL. The first one is recommended for standalone EMSOW PACS Bridge, the second one is recommended for server side Bridge installations. PROTO – the protocol which is used to communicate with EMSOW. The available values are https and http. The first one (recommended for HIPAA compliance) uses encryption, the second one does not. HOST_PATH – the path to EMSOW on the web server. If EMSOW is not located in the root of the domain, you can define the domain path here. Used in custom configurations only. STORELOG – the number of days during which log files are stored. UI_MODE – interface mode. The available values are: 1 – graphical user interface, 2 – console, 3 – console and graphical user interface. ASYNC – switches the asynchronous mode of file transfer on/off. If ASYNC is 1, then the asynchronous transfer mode is used. If ASYNC is not 1 or is not specified, then the file transfer is performed in the synchronous mode. ASYNC_SLEEP – the duration of the pause between iterations of scanning the folder for asynchronously saved DICOM files. UPLOAD_SLEEP – timeout in seconds before scanning the upload folder for DICOM files. STORE_UPLOAD_FAILURES – the number of days to store files that failed to upload. If this option is not provided, the bad files directory will not ever be cleaned up. 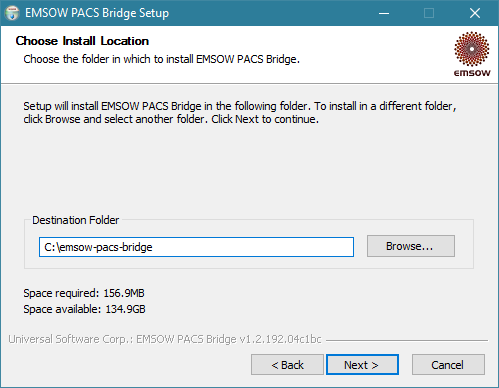 BRIDGE_VERSION – the installed version of EMSOW PACS Bridge. Must not be changed by the user. COMPRESSION_LEVEL – the additional compression for DICOM file transfers: 0 – default from the zip utility, 1-9 – custom compression level, -1 or omitted option – compression disabled. This option is used for uncompressed images only. EMBEDED_JAVA – use the system-wide Java distribution (0) or the embedded distribution (1), i.e. Java installed in the application folder. Embedded by default. DUALSERVER_NETWORK_INTERFACE – the network interface controlled by the DNS/DHCP server.